Last week, the GMA morning show Unang Hirit celebrated their 8th anniversary at the Sta. Lucia East Grand Mall bundled with a show filled with raffles and entertainment as their appreciation for their avid viewers. I'm not sure but I hint that a lot of their viewers are elders who are awake this early to watch them. I wasn't really watching... just listening since I was nearby. I did hear one of the hosts, Regine Tolentino announce that some bands would be performing too. 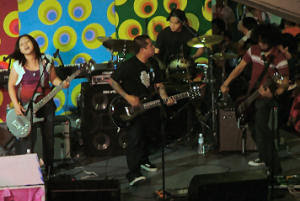 Shamrock, Sugarfree and Urbandub were to perform. I did take a peek when Shamrock performed. 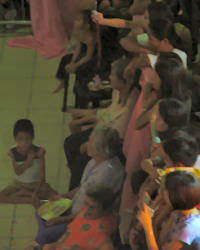 What I noticed was since this is an early morning wholesome show, there were a lot of lolas seated in front. I immediately wondered if the lolas can handle the live band rock music they were set to experience up close. I figured Shamrock is not very loud in terms of rock and can even be considered a bit pop. Sugarfree is on the rock side but could be mellow, as they rendered their revival version of Apo Hiking Society's "Batang-bata Ka Pa". What I was interested to see though is how would the lolas react to Urbandub's music... which is loud and heavy. I dig Urbandub's music but would the elders do ? I thought they'd cover their ears from the loudness, considering they were seated strategically in front of the huge speaker system. Unbelievably though, they were clapping to the music... something you wouldn't see by rockistas unless the band initiates it. Sweetie!!! What an observation! That made me laugh so hard. Good thing wala na ako Lola, kundi kukurutin ka nun! Hehehe. Where Did The Baby Go ?? ?